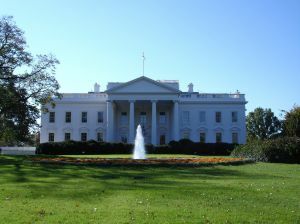 According to a recent news report from the Washington Post, a woman is alleged to have driven up to a security gate at the White House, and, while exiting the car, said she had a bomb and placed a package on the ground. Police say she then got back in her car and tried to drive away from pursuing members of the Uniformed Division of the Secret Service. The United States has Secret Service Special Agents, with whom we are all familiar and whose responsibilities include guarding the President and other public officials, and it also has a Uniformed Division (SSUD). The Uniformed Division of the Secret Service consists of police officers who guard facilities and embassies while driving around the city on bicycles and in marked squad cars. These officers are not Special Agents, but they have arrest powers similar to members of other police forces. Members of the SSUD attempted to stop suspect, when she hit them with her car before fleeing the scene. At this point, bomb disposal teams, SSUD personal, and other first responders blocked off the scene and attempted to inspect the suspicious package. At this point, two high level Special Agents, one of whom is on President Obama’s personal security detail, arrived at the scene after coming from a local bar in what SSUD officers believed to be an intoxicated state. They drove through the police tape and, according to some witnesses, actually drove over the suspicious package, while other witnesses say they only drove very close to the package. SSUD officers attempted to administer standardized field sobriety tests to the two agents but were ordered to released the men and let them go home without submitting to any testing. Luckily, it turns out the package was not a bomb, and the woman who alleged to have left the package was soon caught and charged with assault with a deadly weapon. The deadly weapon was her car, as she allegedly hit one or more officers when trying to escape. Not only have the agents’ suspected drunk driving and alleged misconduct garnered a great deal of media attention, but also so has the new Secret Service director’s response to these events. This is only the latest in a serious of publicly known problems with secret service agents, from agents allegedly hiring prostitutes in foreign countries to letting a White House fence jumper actually open the front door to the facility and walk in the front door after Mr. Obama had just left. These scandals, as they have been called, have led to the resignation of the prior director and the installation of the new director. As our drunk driving accident lawyers in Boston are all too aware, many drunk driving incidents do not get anywhere near the attention to this one, but result in far more damage, including serious personal injury and loss of life. People who are intoxicated and get behind the wheel of a car exhibit serious problems with their judgment and an inability to perform the tasks necessary to operate a car in a safe manner.